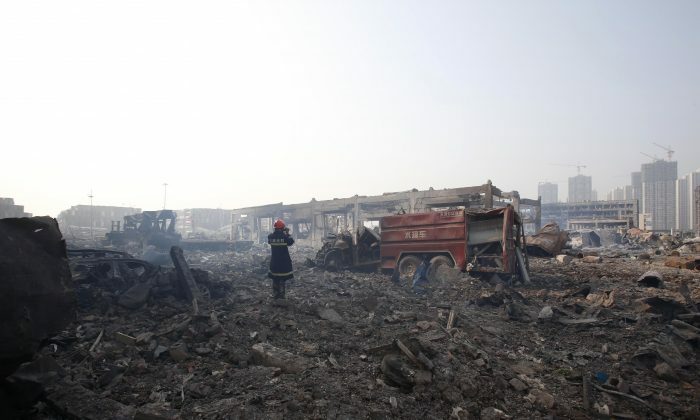 Following investigations into the massive explosions that shook the northern Chinese port city of Tianjin on Aug. 12, China’s vice-premier may be resigning his position due to fallout from the disaster, the Hong Kong publication Chengming says. The vice-premier, Zhang Gaoli, was once the Communist Party boss of Tianjin, where he had jurisdiction over the Binhai New Area, locus of the explosions. Zhang is also widely identified as an ally of former Party leader Jiang Zemin, whose political clique has been the target of the current regime’s anti-corruption purges. The Chengming magazine often publishes information about Chinese regime politics, reportedly derived from unnamed insiders. According to the monthly publication, Zhang Gaoli had asked to resign his job as vice premier during a closed-doors Politburo Standing Committee meeting. The Standing Committee is the Chinese Communist Party’s highest decision-making body. From 2007 to 2012, Zhang served as Party secretary of Tianjin, a provincial-level municipality of over 12 million people on the northern Chinese coast, just dozens of miles from Beijing. He has been criticized by several mainland Chinese news media for his negligence and corruption in office that contributed to the hazardous conditions that precipitated the industrial explosions. On Sept. 3, after the Beijing parade to celebrate the 70th anniversary of China’s victory in World War II wrapped up, an evening event was held. In attendance were foreign statesmen and high-ranking Chinese regime leaders, including the seven-man Standing Committee. The arrivals of Communist Party General Secretary Xi Jinping and his wife Peng Liyuan were followed by Russian president Vladimir Putin and others, as can be seen from state-run televised footage. After them came more foreign politicians, followed in suit by Zhang Gaoli and other Standing Committee members. It may be a sign of Zhang’s recent predicament coming to a head. 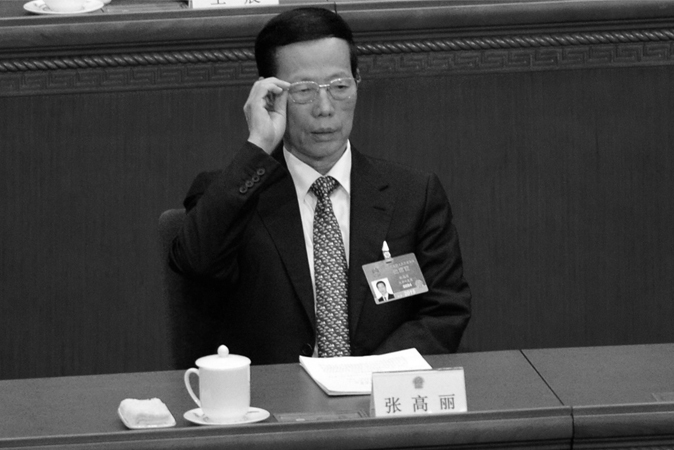 In addition to Zhang, two other Standing Committee members in attendance, Zhang Dejiang and Liu Yunshan, are widely regarded to be Jiang allies. Xi has targeted many officials in league with Jiang’s network, but has so far stayed away from the Standing Committee itself. According to Boxun, a Chinese-language, U.S.-based publication, the Ruihai company, which owned the chemical storage warehouses that fuelled the disaster, was under the control of Zhang’s in-laws. Insiders in contact with Boxun said that Zhang, exercising his influence, had granted his in-laws the permit to establish the deadly storage facilities despite an unfavorable environmental and safety assessment. As head of Tianjin, Zhang Gaoli had focused on the development of the Binhai New Area. Following the explosions this August, many of the officials and business executives sacked were reportedly connected to Zhang. On Aug. 18, when Communist Party anti-corruption investigators took away Yang Dongliang, director of a Tianjin work safety commission, along with his son, the disciplinary agency’s public social media account issued a post stating that Yang had worked as Tianjin deputy mayor and was in charge of manufacturing safety for many years. Many large-scale petrochemical projects in Tianjin Binhai New Area are related to Yang Dongliang, who was in turn promoted at the behest of Zhang Gaoli to the municipal Communist Party standing committee. Eleven active and retired officials and executives of state-run enterprises were placed under investigation following the Tianjin disaster, China’s Supreme Procuratorate announced on Aug. 27. The previous day, it was reported that Dong Yongcun, a Tianjin official who directed a transport committee board, died when he fell from the 8th floor of his workplace. According to a report by wenxuecity.com, he may have been murdered to cover up his knowledge of the circumstances surrounding the Binhai explosions. Could Chinese Officials Be Right About the Dead Fish in Tianjin? The explosions rocking China recently may signal a turning point for the Chinese regime.